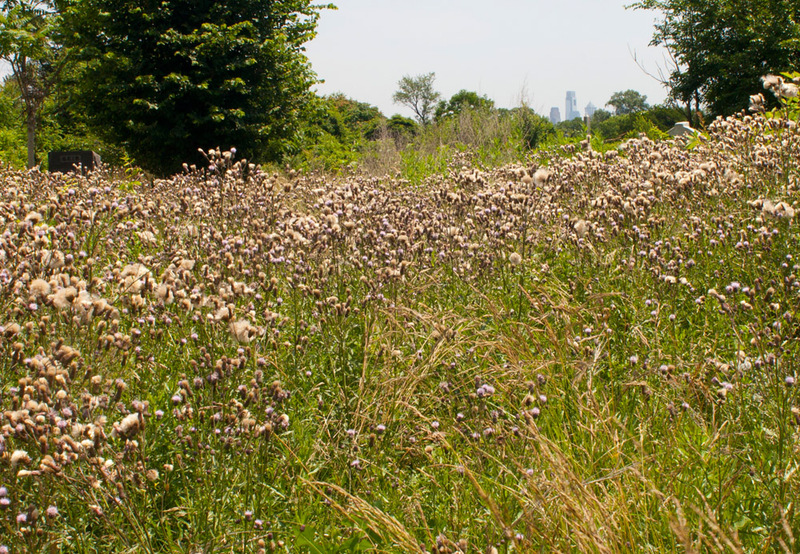 It is an estimated 380 acres of pastoral land and forest, home to wild foxes and deer, an arboretum’s worth of plant life, and a treasure trove of history etched in stone. 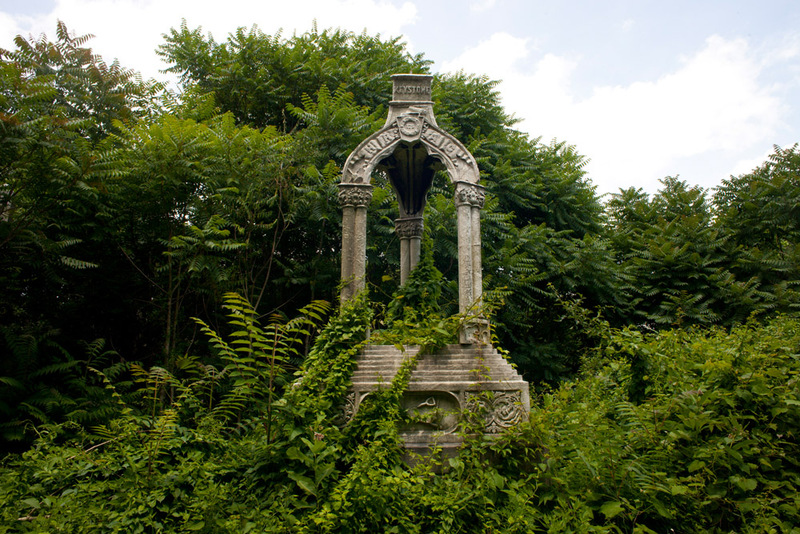 And yet Mount Moriah Cemetery, one of the largest cemeteries in Pennsylvania, remains largely unknown, hidden by weeds. 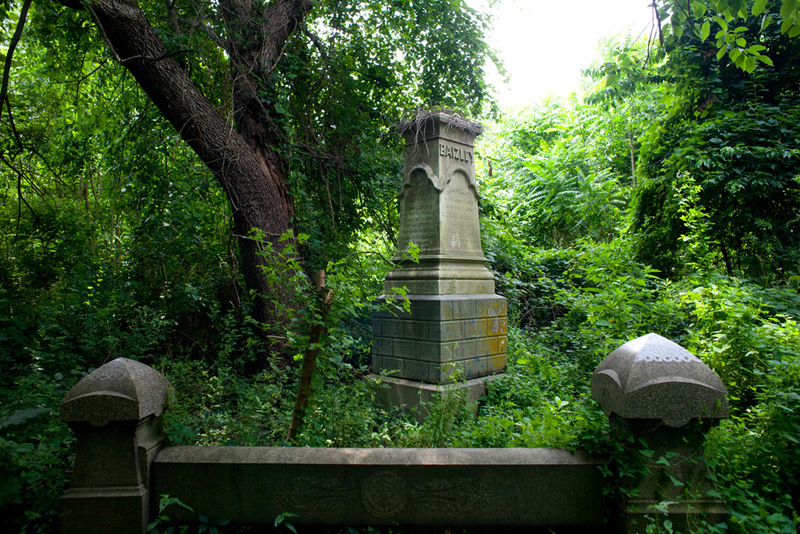 Straddling the western edge of the city on Cobbs Creek, half of the cemetery resides in the borough of Yeadon and half in Philadelphia. For many years this place was neglected, and eventually abandoned. 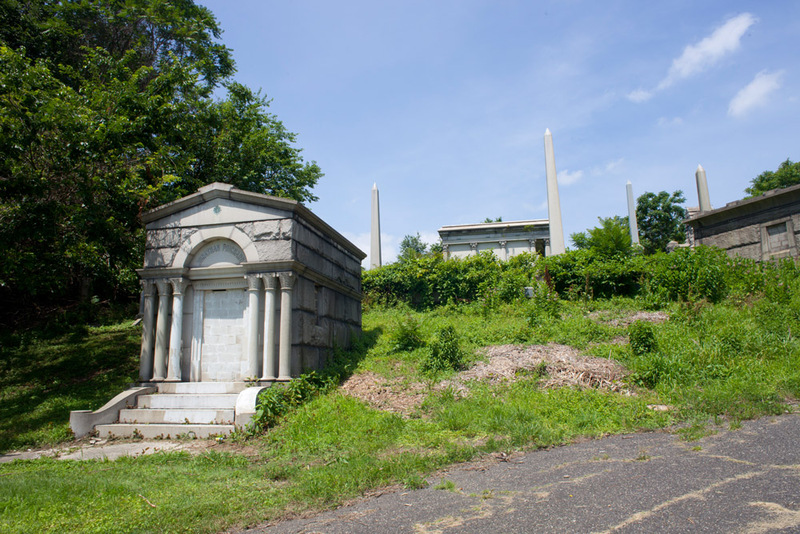 Amazingly, there is currently no legal owner of this property; the last known member of the Mount Moriah Cemetery Association, the governing body of the cemetery since its inception, died in 2004. 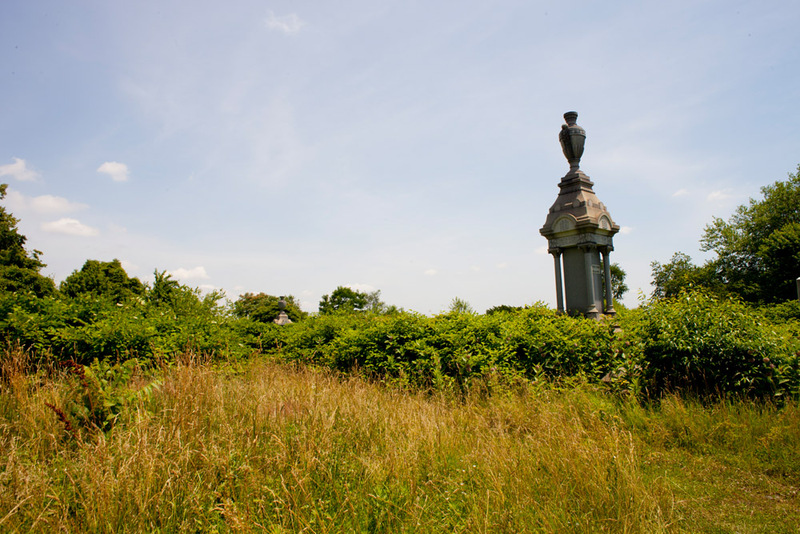 Founded in 1855, Mount Moriah was one of the popular rural burial grounds for the victorian elite of Philadelphia, along with Laurel Hill and the Woodlands. 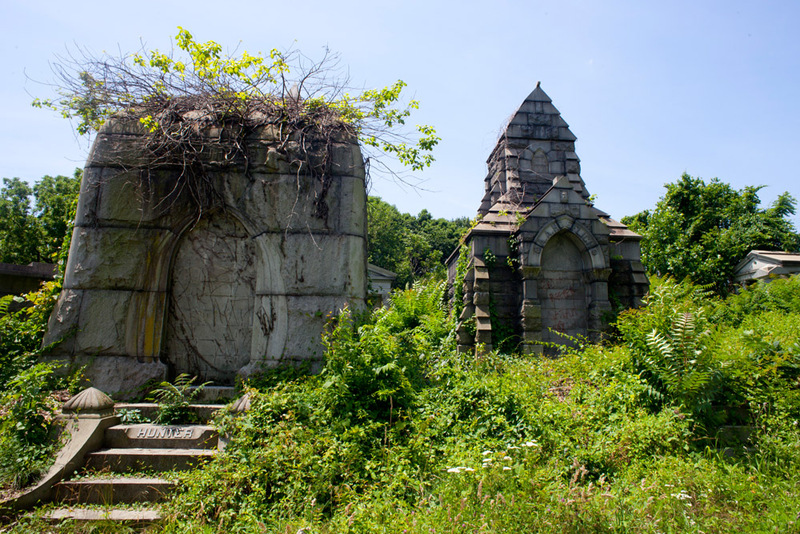 But unlike those other well preserved grounds, a quick stroll around Mount Moriah shows just how neglected it’s been. Headstones are buried and broken, monuments are toppled over. A huge ball of granite sits in Cobbs Creek. 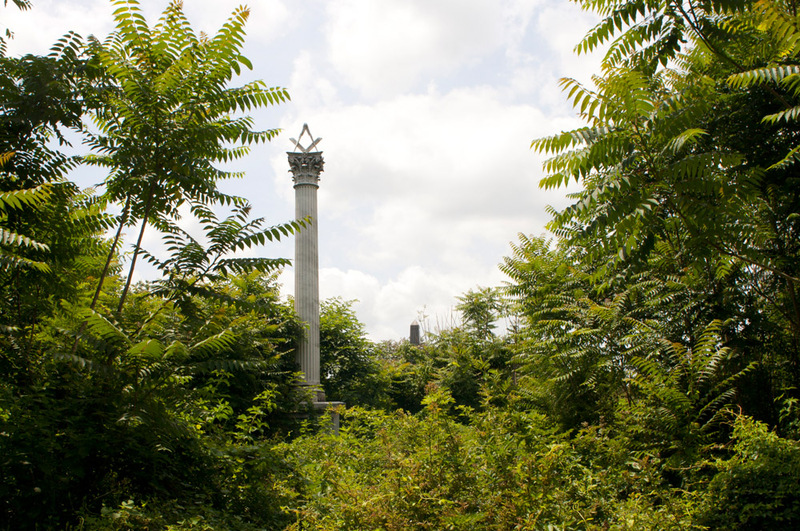 Massive obelisks and mausoleums are obscured by dense forest growth. There is a strange beauty in this return to nature, almost like looking at the ruins of an ancient city, but there is also a terrible loss of history. 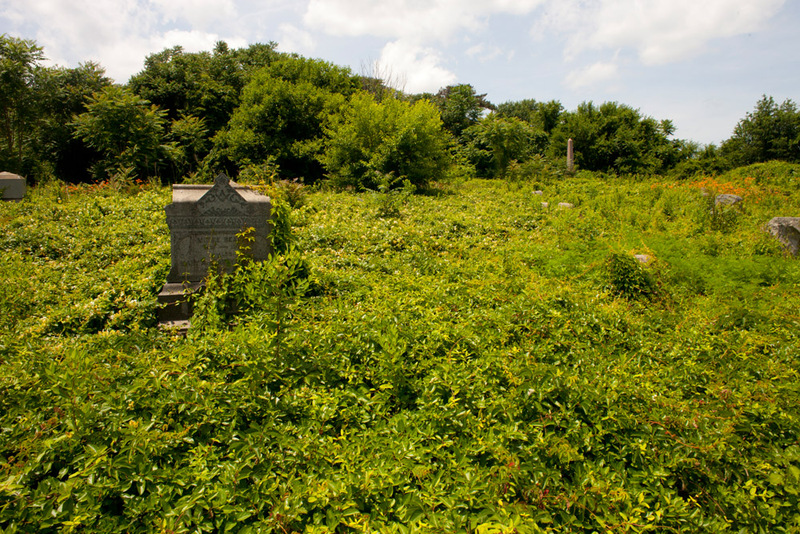 People still come to this cemetery looking for their ancestors, sometimes digging through shrubs, bushes and poison ivy to do so. 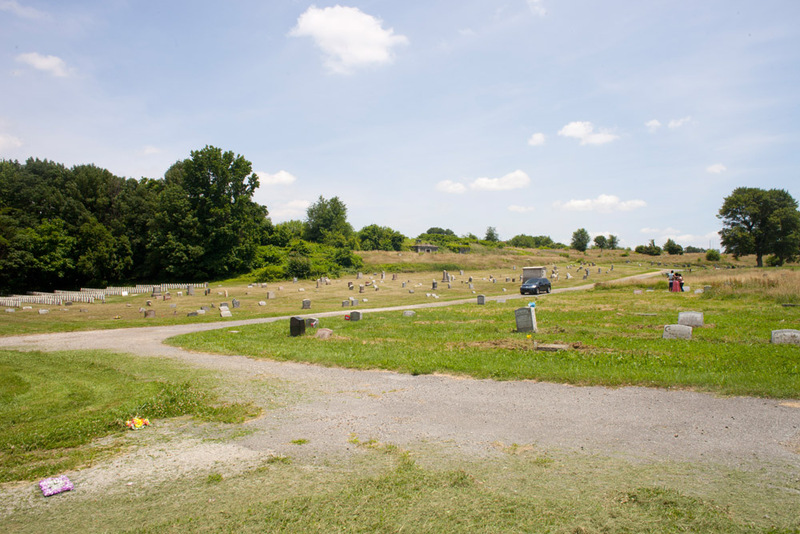 On a Saturday I talked to board members from Friends of Mount Moriah Cemetery, a non-profit that in the last two years has taken serious action in cleanup and maintenance of this land. They were busy on mowers and weed whackers, volunteering their time to maintain the history preserved here. Calling herself the “renegade” of the group, board member Donna Morelli comes across as the sheriff of Mount Moriah. Sporting a handgun on her hip and riding an ATV around the property, she relates her personal investment at the cemetery. Her house and backyard are directly adjacent to the grounds, and she witnessed people dumping trash nearby, a common practice in recent years. Friends communications director and board member Ed Snyder, a cemetery enthusiast who operates the blog The Cemetery Traveler, graciously led me on a tour of the grounds. We walked to the upper portion on the Yeadon side to the Naval Asylum section. 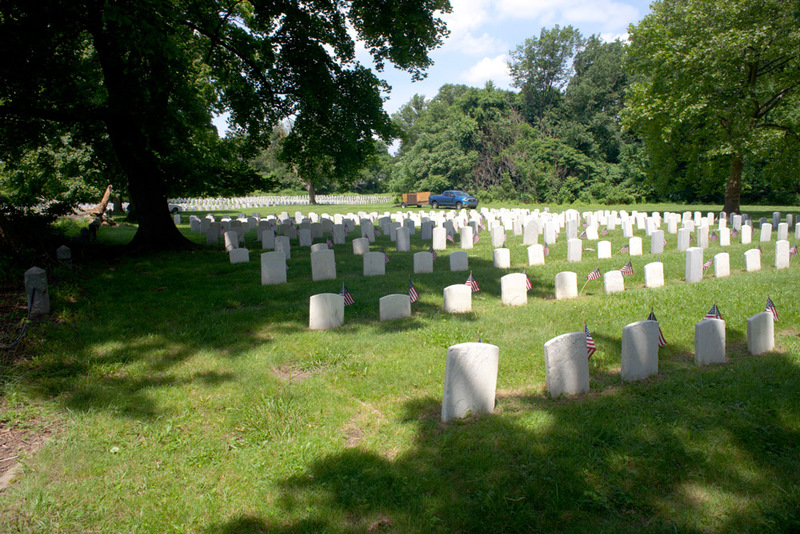 Soldiers who were treated at the Naval Hospital on Grays Ferry Avenue dating to the Civil War are buried here. 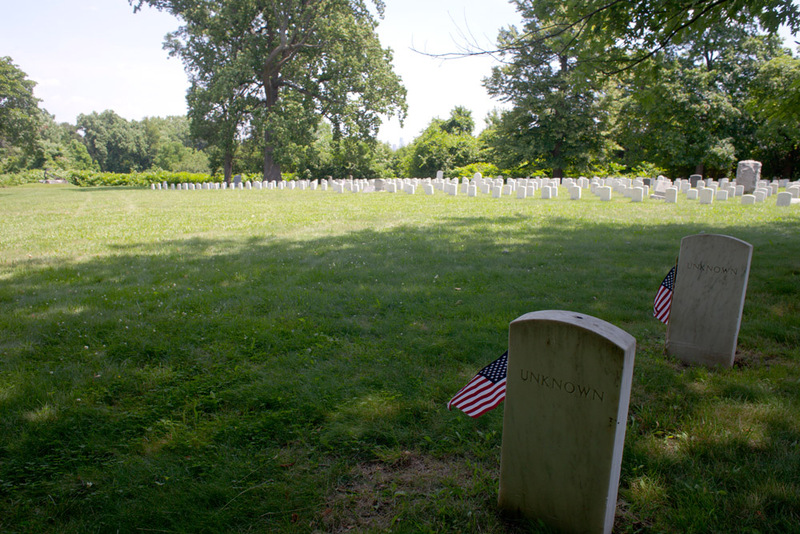 Incredibly, this part of the cemetery, as well as a small military plot on the Philly side, is regularly maintained by the federal government. 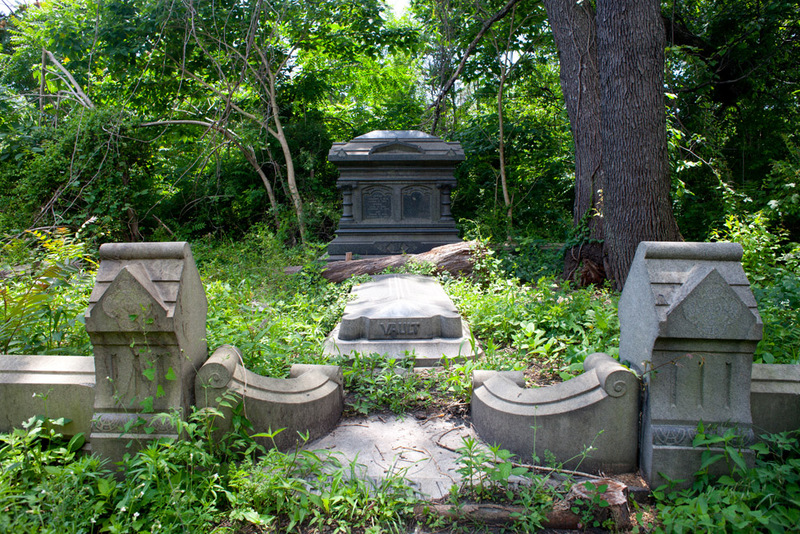 The mowed grass and neat grids of white headstones lie in stark contrast to the surrounding overgrown sections. A metal sculptural anchor, damaged most likely by someone attempting to steal it for scrap, stands as a monument. 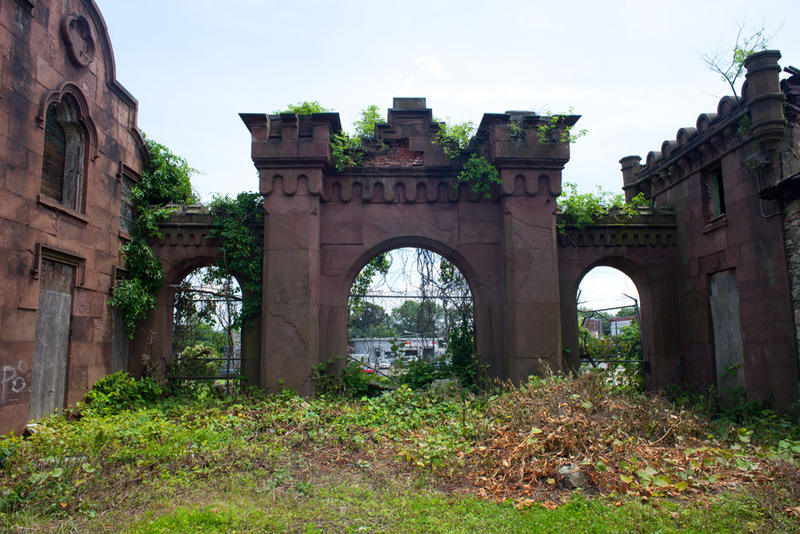 Back on the Philly side, Snyder led us to the Masonic Circle, isolated and overgrown. This section is designed as a circle within a circle, illustrating the Mason’s geometric theories. The center is marked by a tall marble column, topped with the compass. Around the edges additional monuments can be glimpsed, but the relentless summer growth obscures nearly everything. 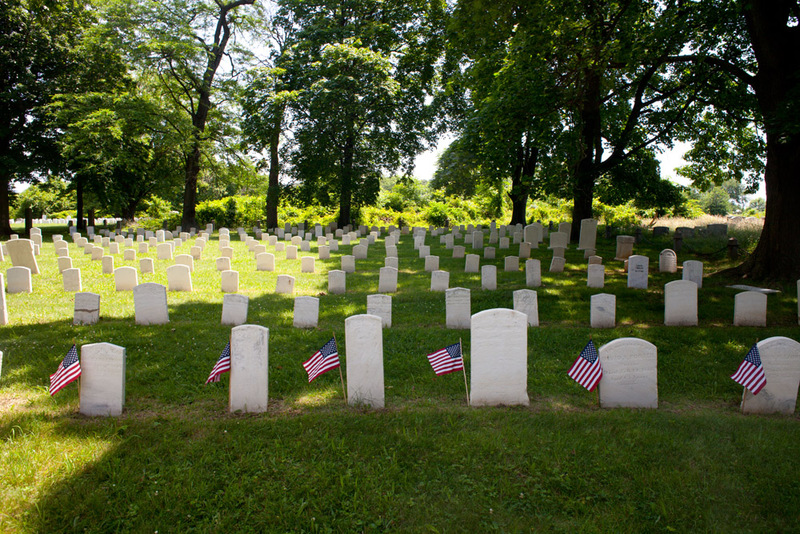 This section also includes the former site of Betsy Ross’ grave. 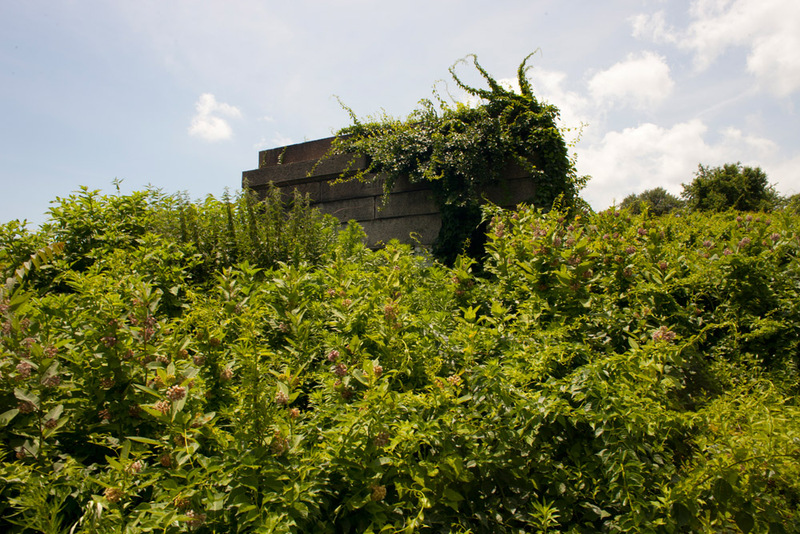 In 1976, city officials decided to move the Ross grave to Old City for the Bicentennial. 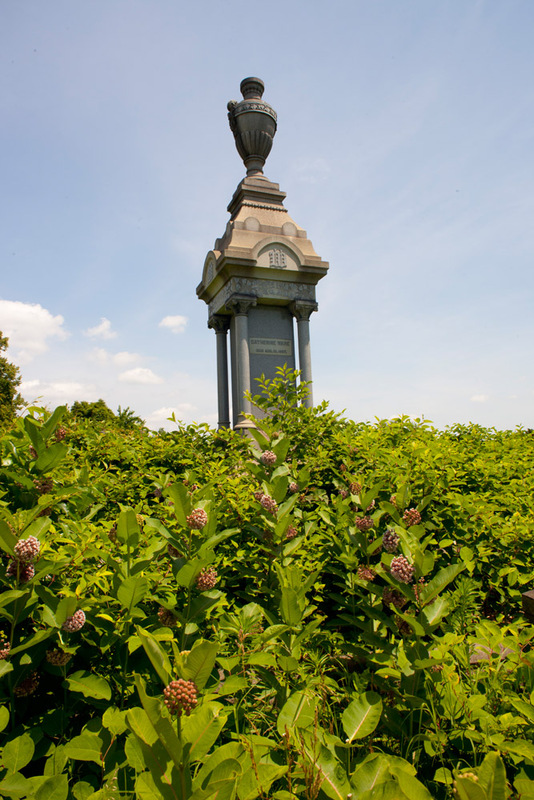 According to Snyder, they found no remains under her stone and so continued to dig out a large area of the family plot, until the first bones found were declared to belong to Betsy Ross. Today the site is marked with a bare flagpole. 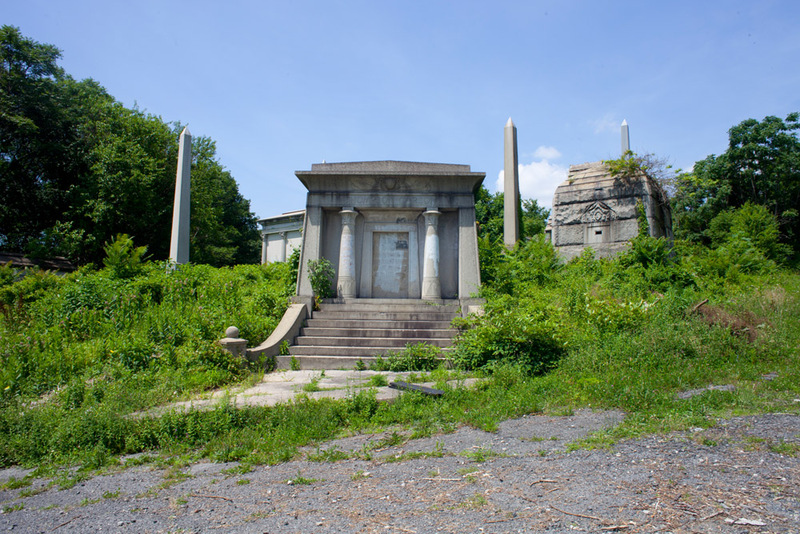 Again on the Yeadon side, a cluster of large mausoleums and obelisks stand on a hill that until recently was overrun by 10 years of invasive tree growth. Board members cut down the trees with chainsaws over the winter. Then on a large spring cleanup day, organized by the Friends of Mount Moriah and supported by Comcast, seven wood chippers were provided by Asplundh to remove the cut trees. 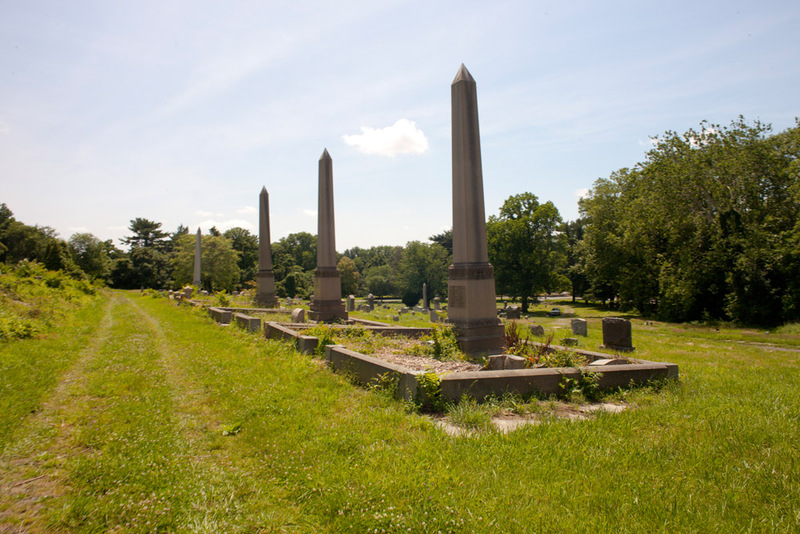 Ownership of Mount Moriah Cemetery is in complicated legal limbo. Currently moving through the court system, assignment of a new owner is an ongoing process. Once this happens, the Friends group speculates that essential grant funding will become much more accessible. Snyder speculates that the last administrators of the cemetery office may not have been the owners at all. They abruptly abandoned the office, leaving the historic records to be damaged by water. Until a new owner emerges, the Friends group does not have authority to touch the buildings or monuments on the site. 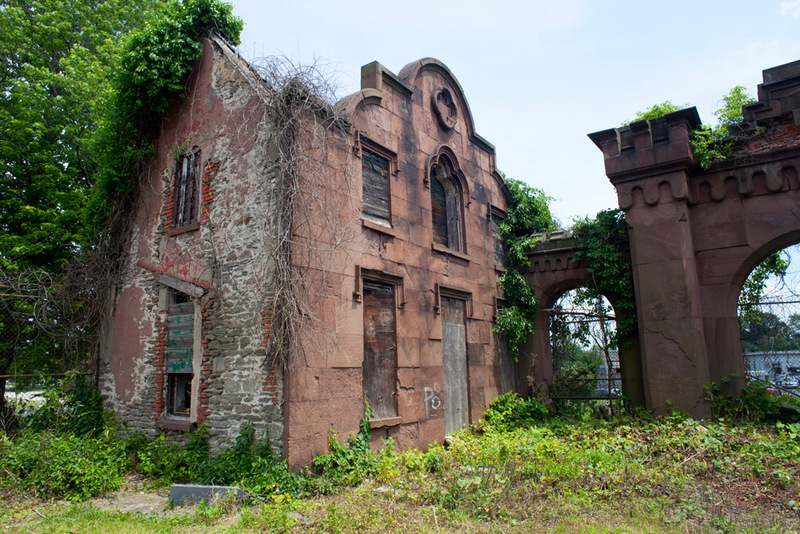 This explains the deteriorated state of the Victorian brownstone gatehouse on Kingsessing Avenue. 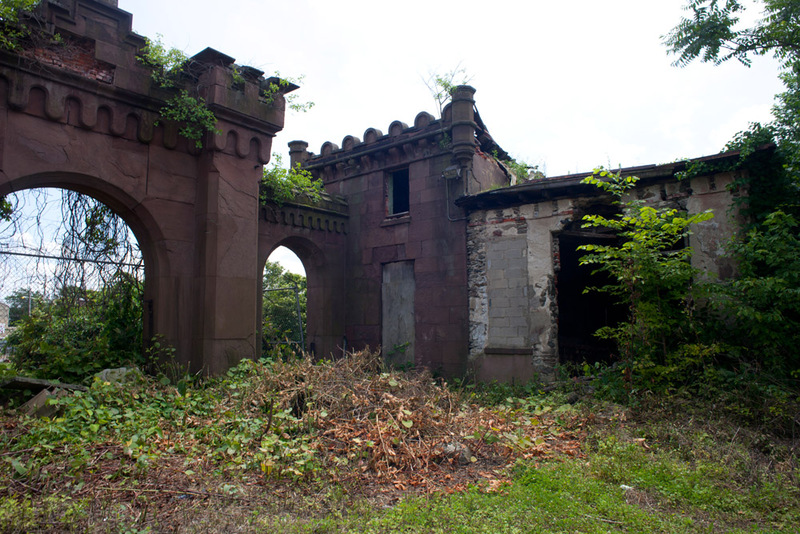 Designed by Stephen Decatur Button, the gatehouse was declared endangered by Preservation Pennsylvania in 2004. 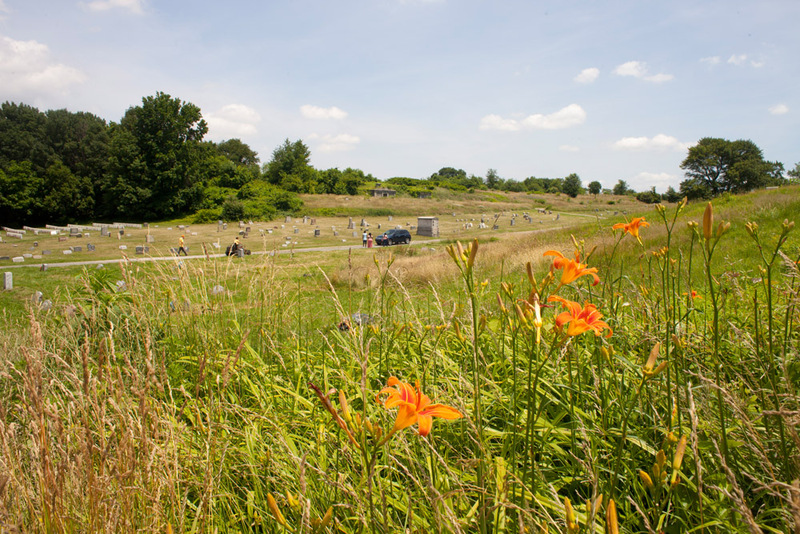 Learn more about the Friends of Mount Moriah Cemetery at their web site HERE. 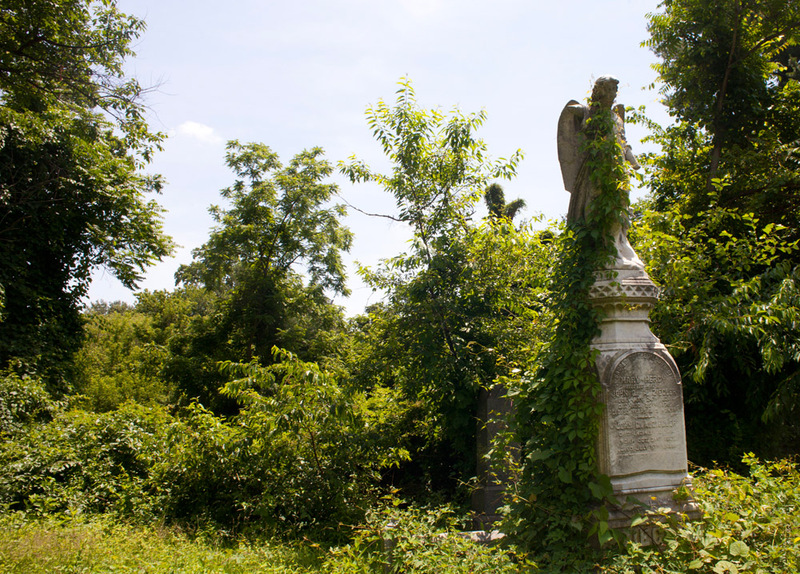 To launch a gallery from the cemetery, click any of the photos below. 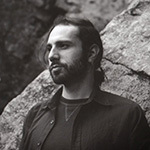 Dan Papa is a filmmaker, photographer, and musician living in West Philly. He is interested in history, landscape, and Himalayan culture. Visit his website at dan-papa.com, on Instagram @danpapa85, and on Twitter @danpapa85. My parish has an isolated plot there essentially for those who could not afford their own burial plots. 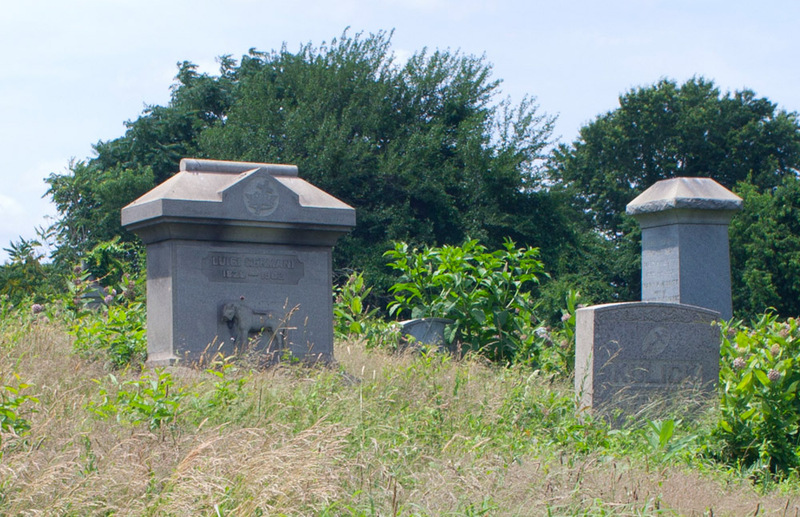 For many years we engaged a contractor to mow it but ultimately he gave up and we haven\’t been able to find anyone to continue that work considering the difficulty of dealing with the cemetery as a whole. I didn\’t realize it was you, Flat Mary Road, until reading this article. I wish I had known when we talked that day because I probably would have asked you more questions then you did I. Is the band still together? I still would love for you guys to play for us sometime if you are. Keep in touch. It was nice talking to you and take care. I also sport my a sidearm when I come here, but I highly encourage everybody to go on a work day and to help clean it up. The place and those buried there deserve it. Thank you so much for your hard work. When I was little I remembered it as a beautiful place. Was so disappointed when we had to bury my sister there. Later she was moved to a beautiful place. My parents got rid of their ownership to the rest of their plots where we as a family thought we were going to lay at rest. God Bless all of you.